Reds agree deal to bring Danish playmaker to Anfield next season. Liverpool have agreed a fee with Ajax for the summer transfer of Denmark international Christian Eriksen, CaughtOffside understands. It is believed that the Reds will pay Ajax in the region of £12.4m for the young playmaker, who has refused to sign a new contract at the Amsterdam Arena and has reportedly set his sights on a move to the Premier League. Liverpool boss Brendan Rodgers believes the 21-year-old Denmark international could be the missing link, as the Northern Irishman looks to assemble a team capable of challenging for a spot in the Premier League top four once again. Ajax technical director Marc Overmars admitted last month that Liverpool have consistently scouted Eriksen, who could now link-up with former teammate Luis Suarez at Anfield. “We have the list of scouts of foreign clubs who have been here recently and Liverpool have been a regular visitor,” Overmars told the Daily Mail. 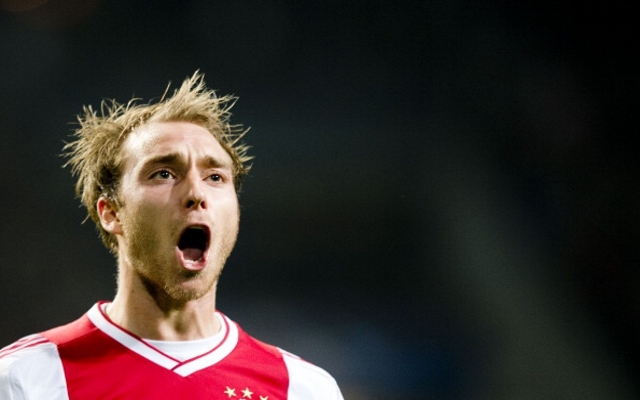 Despite his tender years, Eriksen has already racked up 34 caps for his country and made over 100 league appearances for Ajax, scoring 22 times. The young playmaker, who can operate in the hole or even as a central striker, has netted ten goals in 42 appearances for the Amsterdam club this season. Tottenham, Barcelona and Manchester United have all been credited with an interest in the pass-master, who is now surely set for Anfield. Liverpool are yet to agree personal terms with Eriksen, however.